Contributing to this issue: Murray Archibald, John Archibald, Rich Barnett, Chris Beagle, Tony Burns, Kim Butler, Stefani Deoul, Michael Ford, David Garrett, Fay Jacobs, Lee Lynch, Regina Lynch, Tricia Massella, Brent Mundt, Monica Parr, Mary Beth Ramsey, Richard Rosendall, Terri Schlichenmeyer, Dan Woog, and Doug Yetter. 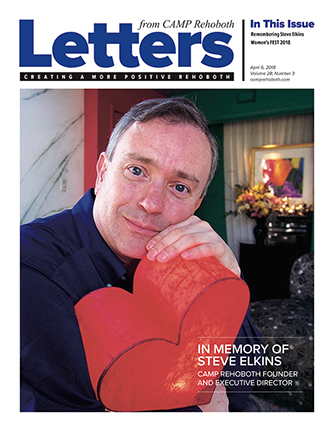 On the cover: In Memory of Steve Elkins­­—CAMP Rehoboth Co-Founder and Executive Director. Photo by Kevin Fleming.